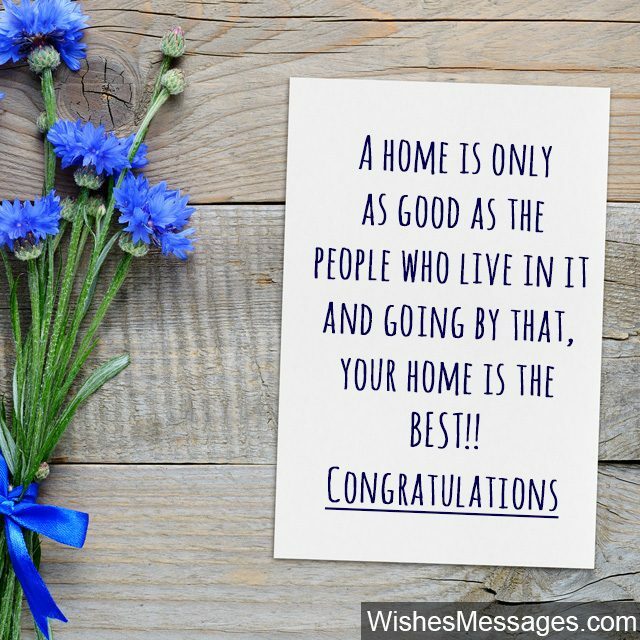 Congratulations for a new home: These wishes, messages and greetings are such that only homeowners can fully understand and relate to the deeper meaning that they reflect. A new house signifies a new beginning. That is the reason why housewarming greeting cards should always resonate good luck, love, happiness and prosperity. Whether it is for your friends, family or colleagues – make sure that the words you chose embrace the essence of taking those first few exciting steps of moving into a place. 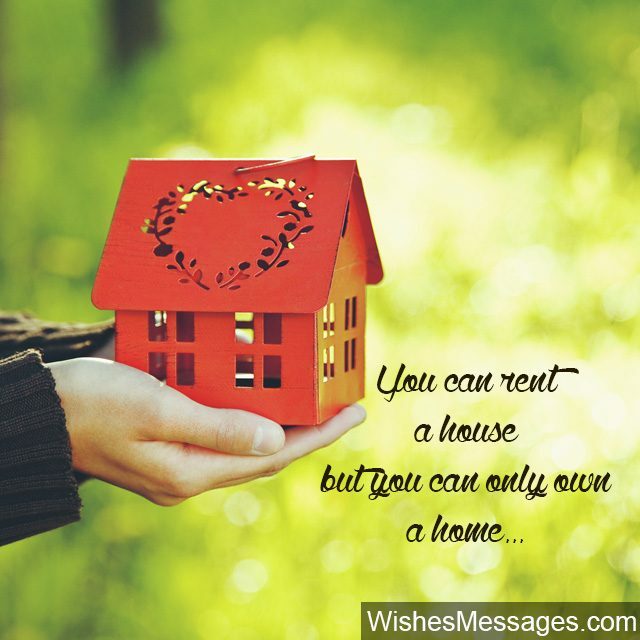 From sweet quotes about the warmth of a new home to sarcastic and funny ones about burdensome mortgage payments – take ideas from this post to write your own innovative and original message that glorifies the pride of home ownership. 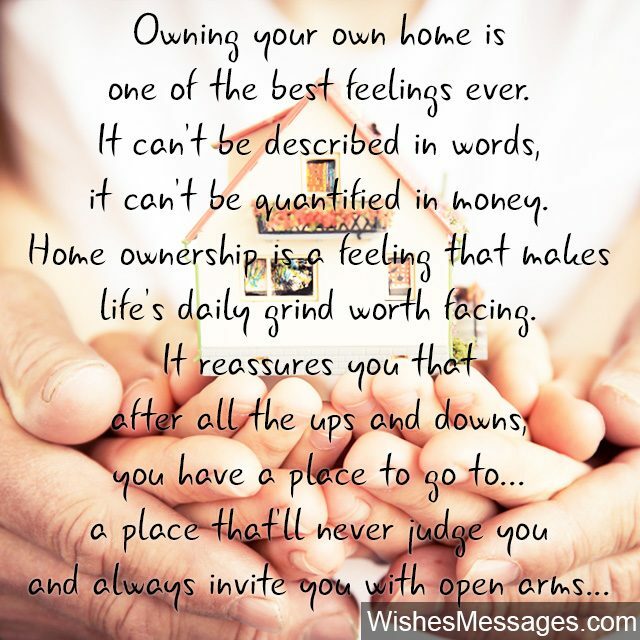 1) Owning your own home is one of the best feelings ever. It can’t be described in words, it can’t be quantified in money. Home ownership is a feeling that makes the daily grind worth facing. It reassures you that after all the ups and downs, you have a place to go to…. a place that’ll never judge you and always invite you with open arms. Congratulations for getting your piece of paradise. 2) Your new home should be called Dream Land because it is really the stuff dreams are made of. Congratulations. 3) Don’t feel bad if you feel proud and haughty, your new home is just too pretty. Don’t feel guilty if you feel like showing off a bit, the beauty of your new home is totally worth it. Congratulations. 4) A new home drains life’s savings, but in return gives a new life. Congratulations. 5) Worthy of applause, is your new house. Wish you happiness, many moments priceless. Congratulations. 6) You can rent a house but you can only own a home. Congratulations. 7) When you bought your new home, you didn’t just fulfill a need, you accomplished a deserving feat. It takes guts to take on a mortgage, but I am sure it will be all worth it as you age. The loan repayments may feel like a heavy burden right now, but years later when your home’s value increases you will say WOW. Congratulations. 8) You should christen your house as PERFECTION because everything seems to be just right. Congratulations. 9) May the windows and doors of your new home open up to good luck, prosperity and fortune for your entire family. Congratulations. 10) May your new home keep you cozy in winter, cool in summer and sheltered during the rains. May it also give you a prosperous life, full of happiness and free of pains. Congratulations. 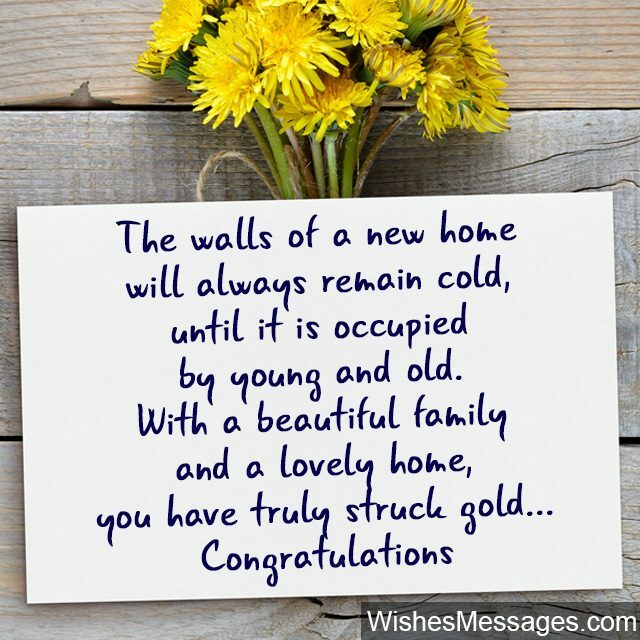 11) The walls of a new home will always remain cold, until it is occupied by young and old. With a beautiful family and a lovely home, you have simply struck gold. Congratulations. 12) HOUSES are all about cement, bricks, mortar and wood. HOMES are all about loved ones, family, parties and food. Congratulations for your new home. 13) When the sun sets in the west, the view from your living room will be the best of the best. Congratulations. 14) Parties, gatherings and family events, your new home is set to create priceless moments. Hugs, smiles, laughs and giggles, friends and family will make your happiness double. Congratulations. 15) Congratulations for breaking yourself free from the chains of landlords, but accept my condolences for tying yourself in the chains of mortgage repayments. 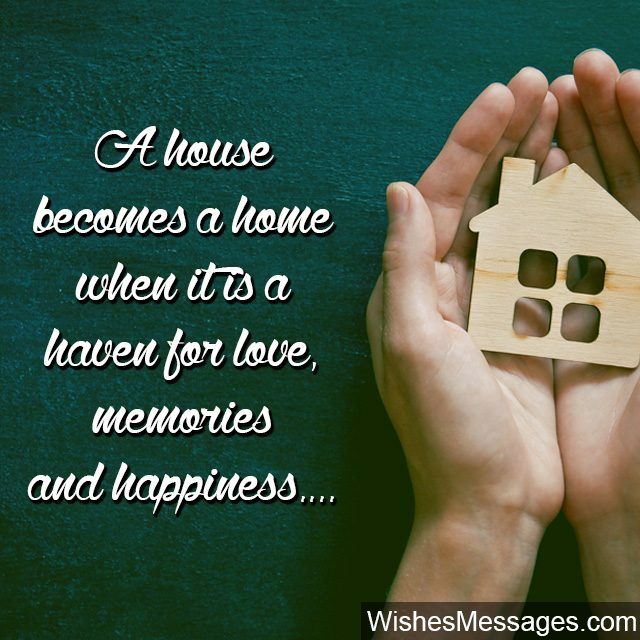 16) A home is a haven for love, memories and happiness. Congratulations for getting yours. 17) My heart skips a beat when I see your new home. It has the perfect ambience, the perfect decor and the perfect tone. Congratulations. 18) When you enter your new home, heave a sigh of relief. This is a new start to your life and time to turn a new leaf. Congratulations. 19) Warm your new house, by living the happy times in it with your family and spouse. Congratulations. 20) Congratulations for buying a house which is so luxurious and fine. Here’s wishing you good luck as we drink and dine. 21) A home is only as good as the people who live in it and going by that, your home is the BEST. Congratulations. 22) After a busy day, you will seek peace and solace, for which your new home will be the ultimate place. Congratulations. 23) Even the walls of the most expensive hotel in the world, can never be as warm as those of your beautiful new home. Congratulations. 24) Congratulations for buying yourself a new home and locking yourself in a cage called mortgage. 25) Your new home is an investment that will reap rewards for a lifetime. You made a wise and beautiful choice. Congratulations. 26) Your new home is… a slice of heaven, a glimpse of beauty, a mark of elegance, a sigh so pretty. A warm feeling, a vibrant hue, a cozy ambience, a dream come true. Congratulations. 27) Congratulations for becoming the owners of a home as beautiful as the owners themselves. 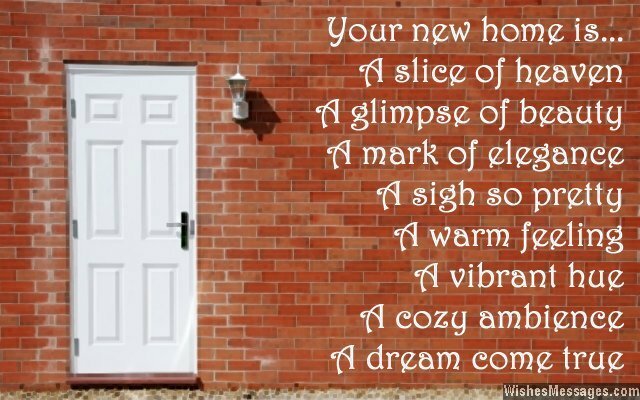 28) As you step foot into your new home for the first time, please take a moment to read this sweet rhyme. Wealth will always follow hard-working people like you, prosperity and success will follow you too. But what is more important is the love of your family, so cherish every moment you spend in your new home with people who you love dearly. Congratulations. 29) Nurture the time spent in your new home with love and care so that your family never has to face despair. Congratulations. 30) You may be under pressure to pay back your home loan, but your beautiful new house will surely give you no reason to moan. Congratulations. 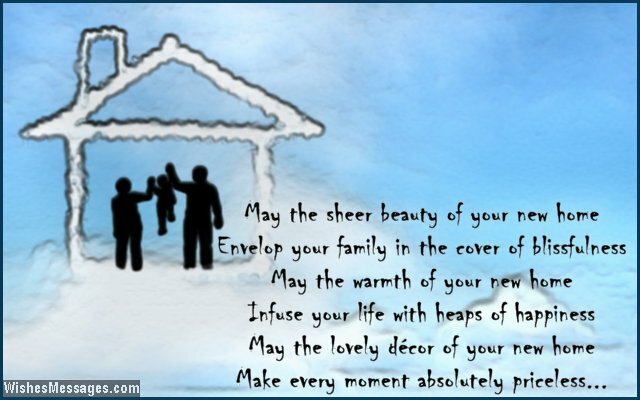 31) May the sheer beauty of your new home envelop your family in the cover of blissfulness. May the warmth of your new home infuse your life with heaps of happiness. May the lovely décor of your new home make every moment absolutely priceless. Congratulations. 32) Putting your foot in your very own new home, is one of the best steps you’ll ever take in your life. Congratulations. 33) You will not realize the value of your new home, until you come back from a stressful day at work and lounge in a place that you can truly call your own. Congratulations. 34) I hate to be the bearer of bad news but the worst part of owning such a beautiful home like yours is that you will never feel like leaving it. Congratulations, future homebody. 35) Your new home is just not a new roof over new walls. It marks the beginning of a new life, new memories and most importantly, new celebrations for friends like us! 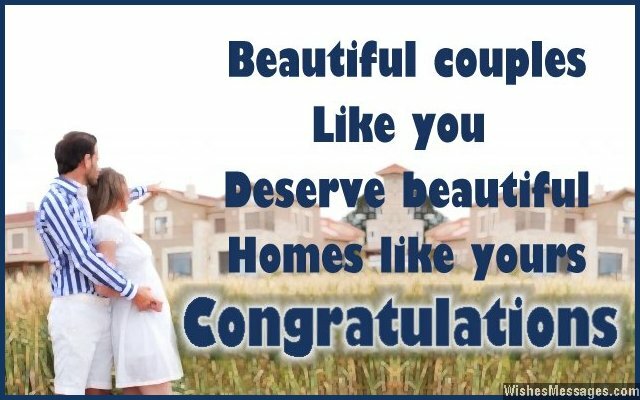 36) Beautiful couples like you deserve beautiful homes like yours. Congratulations. 37) The décor of a home speaks a lot about the personalities of the people living in it and yours says that you are – smart, modern, trendy, warm, welcoming and beautiful. Congratulations. 38) A brand new home, a loving family and a life worth envy – you already have everything so all I am going to wish for you is that your lives continue to be lovely, carefree and happy. Congratulations. 39) There are lots of new memories waiting to come inside, as you open the doors of your new home wide. Best wishes to you and your family, as you start carving out a new destiny. Congratulations. 40) You might be counting the value of your home in dollars right now. But years down the line when your children grow up within these walls its value will become priceless. Congratulations for getting the perfect abode for your family.